Everyone knows the two countries in the world with the largest populations: China and India. But what countries are next on the list? The United States is third, with 331 million people. And fourth in total population is Indonesia, with 265 million people. When it comes to total size of economy, Indonesia is now about 9th, similar to UK and France (using the purchasing power parity exchange rate). By 2050, Indonesia could also be the fourth-largest economy in the world, behind China, India, and the United States. "A wave of reforms reduced the dominant role of the government in the economy—a legacy of the postcolonial period—and began a shift toward a more market-based economy. 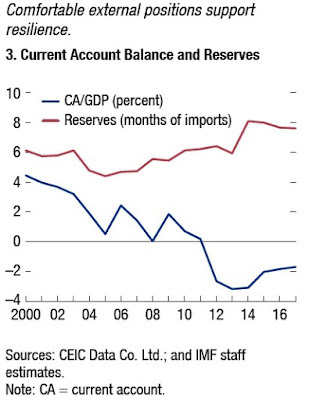 Policy frameworks and toolkits were upgraded, including adoption of a floating exchange rate, fiscal rules that limited the deficit and capped public debt, and an inflation targeting regime. The banking sector was also restructured, and regulation and supervision were overhauled ... Various sectoral reforms were implemented to open up the economy and improve the business environment, including privatization of some state-owned enterprises, elimination of monopolies in some sectors, and reduction of general subsidies. More recently, fuel and electricity subsidies were more effectively targeted to low-income households; the land acquisition process for infrastructure projects was streamlined and made more flexible; the foreign direct investment (FDI) regime was partially liberalized, including for logistics, tourism, and agriculture; and the setting of the minimum wage was made more transparent and predictable ..."
Annual economic growth in Indonesia seems to have settled at about 5% recently. 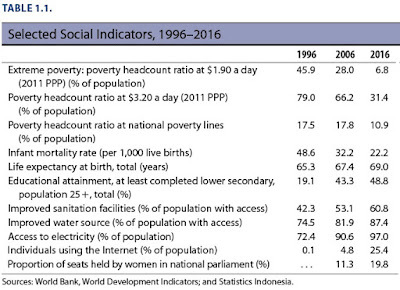 In the last 20 years, per capita GDP in Indonesia has risen by about 250%. 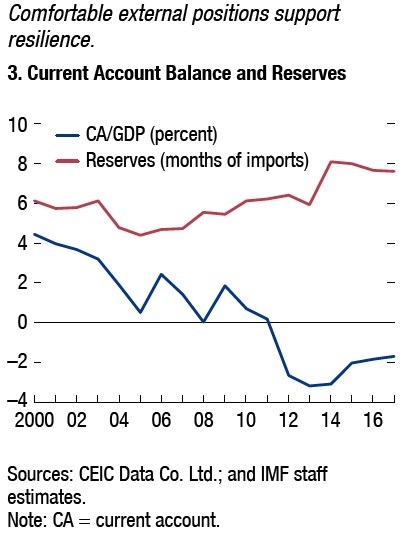 The source of that growth is not large trade surpluses; indeed, Indonesia has recently been running trade deficits. 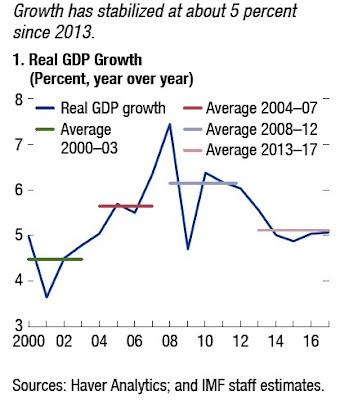 Indonesia's growth also doesn't come from government fiscal stimulus. The ratio of public debt/GDP has been falling in Indonesia. Finally, here is a list of some social indicators (trimmed down from a more extensive chart in the paper). Poverty and infant morality are way down, while education, life expectancy, and access to clean water, electricity, and the internet are on the rise. Indonesia of course faces a number of ongoing issues as well, and the chapters of the book discuss them in some detail. They include "rigid labor legislation," "low tax revenues and thin domestic financial markets," "the low level of FDI and low participation in global and Asian value chains, "one of the lowest internet penetration rate in the ASEAN region," and others. 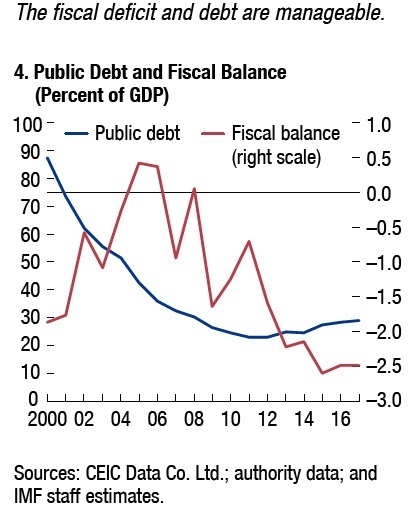 "[D]espite strong demographic tailwinds and steady capital accumulation, lower productivity growth has led to a decline in potential output growth in recent years." Indonesia's economy is somewhat vulnerable if/when China's economic growth slows down. Indonesia is a country spread out across thousands of islands, where hundreds of languages are spoken, so there is also inequality and outbreaks of ethnic tensions. There are concerns about challenges to Indonesia's democratic system. But the fact that economies face challenges isn't news. 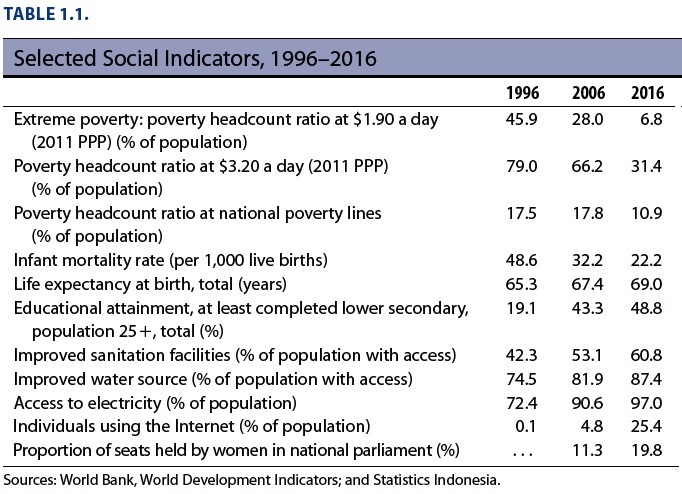 The fact that Indonesia's economy has performed so well in the last two decades in raising the standard of living, and and has plausibly promising prospects could be a welcome bright spot in the world economy for the next few decades.